Rajorshi Chakraborti is a novelist and a short story writer. His first novel, Or the Day Seizes You, was shortlisted for the Hutch-Crossword Book Award (2006). His second novel, Derangements, was published in India by Harper-Collins in 2008. His third novel, Balloonists, was released in published by Westland Books (2010). “When did I go to sleep and where had I awoken?” wonders the narrator of one of the stories in Rajorshi Chakraborti’s new collection, “In an askew world where everything was familiar but nothing unfolded as I foresaw it?” It’s a question that might come from any of Chakraborti’s protagonists, going back to his excellent debut novel Or the Day Seizes You, the dominant tone of which was hinted at by a cover jacket that combined two Dali paintings about dreamscapes and endless drifting. That novel’s mood of escalating paranoia had reminded me of Kazuo Ishiguro’s great, surreal The Unconsoled, a book about a man who – as Pico Iyer once memorably put it – is “lost in a foreign place and unable to read the signs”. 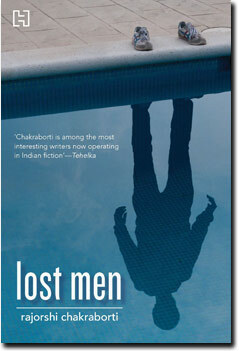 Chakraborti, one of the most provocative Indian English novelists of his generation, has often worked with this theme in his fiction, and the stories in Lost Men (one of which, “The Good Boy”, was – in full disclosure – first published in that I co-edited) are vignettes about lives that have spun into disorder. For instance, the darkly comic “Viju’s Version” – my favourite of these pieces – begins by recounting the series of missteps that lead a well-meaning boy to bring public humiliation to his school, before segueing into a narrative about the same luckless Viju’s entanglements with Maoists and organ-buyers (“he was always the victim of accidents far outside his control,” an acquaintance sarcastically reflects). In “The Last Time I Tried to Leave Home…” another young man – embarking on a life-changing journey – finds himself unable to tread a straight path to the airport. Two other stories are about people who literally cannot play ball: the narrator of “Knock, Knock” is assailed by a bank employee who “bowls” stones at him; in “The Third Beside Us”, a boy is invited to join a cricket match that turns into a nightmare, including a batting stint that he likens to Sunil Gavaskar’s infamous 36 not out in the 1975 World Cup. Lost in time as well as in space, many of the characters here attempt to understand – or just to properly recall – their own pasts. This might take the form of a man unexpectedly encountering his old family doctor in a place far from his hometown (in “City Lights”) and shortly afterwards finding himself in a part of the city made familiar by a childhood memory of letters from a friend. Or it might (in “Half an Hour”) take the shape of a boy being distracted from an urgent errand by a glimpse of someone who may or may not be an old classmate, now apparently wearing a blind person’s glasses. Often, the characters’ growing desolation is concealed beneath a restrained tone. “I kept moving around, met a few diverting people,” says the title story’s narrator – a man whose wife has recently died – but this is a deceptively simple summary of what is a very layered tale about grief and love. Occasionally the narratives conduct metaphysical conversations with each other, as in “A Good Dry-Cleaner is Worth a Story”, which describes a road accident that has been alluded to (as a dream) in another piece. This means that though Chakraborti’s prose is consistently direct and elegant, these stories are elliptical, sometimesclaustrophobic, and demand a reader’s full concentration. (They didn’t all work for me: my attention drifted during passages of “Down to Experience: A Novella”, a rambling tale set in late 1940s Europe, involving people caught between groups and ideologies, unsure what side they or their friends are on, or if sides even exist.) However, once you acquire a taste for this writer’s very particular universe – with its glimpses of the inner spaces of people confounded by delays, detours, bad luck and unreadable signs – it is very hard to leave it.